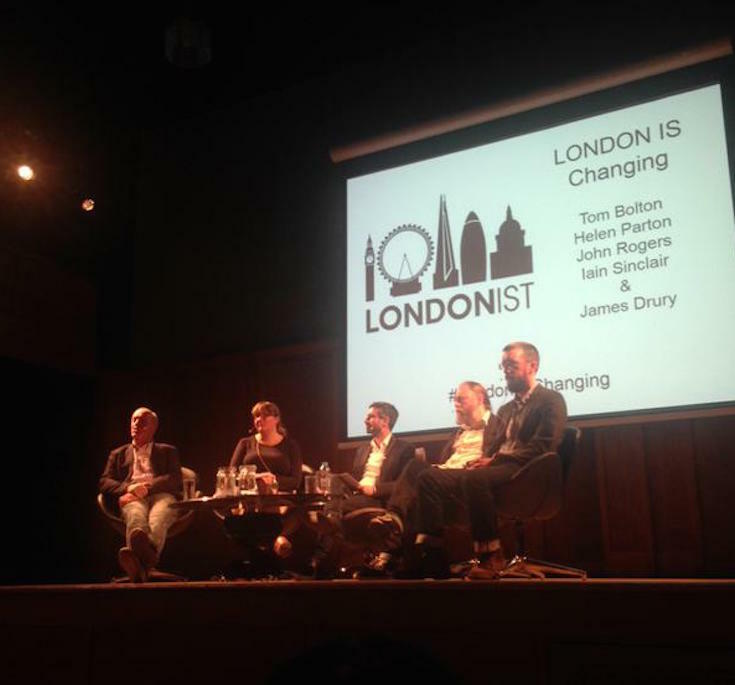 London is changing — that's a truism. But the pace of change, and the impact that's having on the city's communities is a debate of keen interest, as evidenced by the packed-out Conway Hall last night. Chaired by Londonist's editor-in-chief James Drury and featuring authors Tom Bolton, John Rogers and Iain Sinclair, along with editor of onOffice magazine Helen Parton, the first in Londonist and Conway Hall's series of events called London Is... aimed to look at 'good' and 'bad' change, what does 'gentrification' mean, and who's being affected. With such a huge topic, perhaps being restricted to an hour-and-a-half time limit was a little ambitious, but we did our best to pack in a huge variety of discussion, including how communities can successfully challenge the planning system; why those who are disproportionately affected by rising house prices — and all that accompanies that rise — are under-represented at discussions; and whether or not it matters that London is facing losing its creative economy. With a broad and intelligent range of questions and comments from the audience, there's plenty more to discuss, and hopefully we'll be able to run a follow-up before too long. Our next London Is... event is London is Wild, on 2 November at Conway Hall, when we'll be finding out about London's wildlife. Tickets are available here.